The Compulsive Reader: It's Here! It's finally here, Fire by Kristin Cashore! This is probably one of my favorite books of 2009, so please do check it out! In my opinion, it;s even better than Graceling! Fire is an outcast in her society, her vibrant and unnatural hair color an indicator of her monster status and her dangerous powers of mind control. She's the only one left of her kind, and she resides far out in the country where she is safe from those who fear her and would harm her. Meanwhile, King Nash is struggling to hold on to his kingdom as enemies from the north and south threaten to overthrow him. Both Nash and his brother Brigan distrust Fire for the havoc her father wreaked on the kingdom before his death, and Brigan would like nothing more than for Fire to be killed. But now, unless they find a way to resolve their differences and work together, they'll never win the impending war. In this prequel to Graceling, Kristin Cashore has woven an intricate and brilliant tale that reveals a whole new world beyond Katsa's seven lands, full of fantastic creatures, strange powers, and a land teeming with political tension. For the most part, the characters in Fire are made more mature than Graceling's protagonists by the complexities of their past. Fire is a strong heroine, tough and fiercely independent, but loyal and kind through and through. She is genuinely thoughtful, and her concern for others stands out, especially as she struggles to reconcile her own nature and her father's actions with who she wishes to be. The beginning of the book is slightly slow, but in no time at all it speeds up as Fire is launched out of her comfortable world and into an unknown and dangerous one. Cashore's plot is wonderfully complex and elaborate, but tight and solid. Fire also deals with many emotions--guilt, regret, fear, love, and empathy--in a very affecting way. Cashore is a master at using all of these elements to create a suspenseful, surprising, and totally engaging read. Though Fire is not a happy, warm book all of the time--it deals with death and violence and life's cruelties, but in a sensitive and optimistic manner, it has its moments of humor and romance. Cashore's talent for pulling off such an epic and engrossing read makes her one of the best YA fantasy writers since Tamora Pierce first introduced her character Alanna to the world. 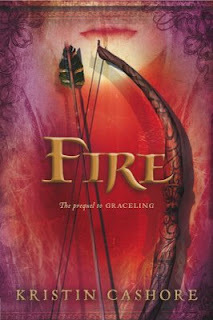 If readers weren't already in love with Cashore after reading Graceling, they will be after reading Fire. I've got to read the first book yet, so I can get to this one!!! Hey also - you won an award at my blog.